Yum! Brands, parent company of KFC, Pizza Hut and Taco Bell, announced the launch of its annual World Hunger Relief effort with the “Pass The Red Cup” challenge featuring multi-Grammy Award winner and international superstar Christina Aguilera. According to the United Nations, there are nearly 850 million people around the world who suffer from chronic hunger. Yum! Brands’ World Hunger Relief effort is the world’s largest private sector hunger relief initiative, spanning more than 125 countries, over 40,000 KFC, Pizza Hut and Taco Bell restaurants and 1.5 million associates. 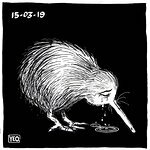 The initiative began in 2007 in an effort to raise awareness, volunteerism and funds for the United Nations World Food Programme (WFP) and other hunger relief agencies. The new “Pass The Red Cup” challenge is designed to drive awareness and inspire donations for Yum! Brands’ World Hunger Relief. Aguilera is challenging media outlets, other celebrities, influencers and her fans around the world to share #PassTheRedCup on their social channels to raise awareness of the global hunger issue. She’s also urging people to donate US$5 to help feed 20 schoolchildren on the campaign’s website, HungertoHope.com. Every dollar raised will go directly towards WFP’s operations to fight hunger around the world. 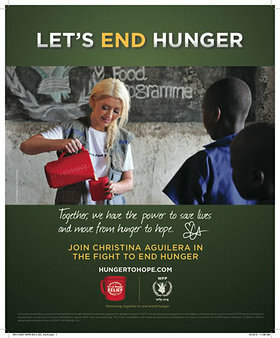 Aguilera will appear in a global World Hunger Relief public service announcement, posters at KFC, Pizza Hut and Taco Bell restaurants, advertising and online efforts. She has served as a volunteer spokesperson for World Hunger Relief since 2009 and has helped to raise millions for WFP and other hunger relief agencies. She is also an “Ambassador Against Hunger” for WFP and has traveled on relief trips to Rwanda, Haiti and Guatemala. In 2012, World Food Program USA honored Aguilera and David Novak, Yum! Brands’ Chairman and CEO, at the U.S. State Department with the George McGovern Leadership Award for their hunger relief efforts. In addition, she received a special achievement award at the 2012 National Council of La Raza ALMA Awards and was the first recipient of the Muhammad Ali Humanitarian of the Year Award in 2013 for her hunger relief work. “The beautiful faces of the children I’ve met in Rwanda and in other countries are with me every day and fuel my passion to raise awareness of the global hunger issue,” said Aguilera. “That’s why I’m urging everyone to join me and #PassTheRedCup for Yum! Brands’ World Hunger Relief effort. Together we can move millions of children from hunger to hope.” People can accept Aguilera’s challenge by sharing #PassTheRedCup on social channels and by donating $5 on HungertoHope.com. “With nearly 850 million people going hungry worldwide, we all need to help find a solution to this critical issue,” said David Novak, Chairman and CEO of Yum! Brands, Inc. “We are thankful to WFP for their incredible life-saving hunger relief efforts in developing countries and to Christina Aguilera for her passion to raise awareness and inspire people to get involved. I’m especially proud of our 1.5 million associates around the globe who are volunteering in their local communities to fight hunger. As one of the world’s largest restaurant companies, we have the privilege and responsibility to lead the fight to end hunger and save lives,” said Novak. Since 2007, Yum! Brands’ World Hunger Relief effort has raised more than $185 million for WFP and other hunger relief organizations and provided 740 million meals to save the lives of millions of people in all corners of the world. Consumers can visit HungertoHope.com, donate in KFC, Pizza Hut and Taco Bell restaurants worldwide (no purchase necessary – see calendar below for U.S. campaign dates) or text “WHR” to 90999 in the U.S. to make a donation. Yum! is also addressing hunger across the U.S. through its Harvest program. Since its launch over two decades ago, Harvest has become the largest prepared-food donation program in the world. Through Harvest, Yum! has donated more than 169 million pounds of food, with a value of nearly $765 million, to those at risk of hunger in the U.S. Yum! has also been the primary sponsor of the Dare to Care Food Bank in Louisville, Ky., for 12 years with donations totaling more than $12 million.